Internet debates have seen what one could refer to as ‘the rise of the blowhard’ – people who throw down the name of a fallacy as if it somehow ‘wins’ them the discussion. But the identification of fallacies, even when properly executed, can rarely be used to prove the veracity of a position. Oftentimes, the identification of a fallacy is merely useful in pinpointing the holes in a given piece of reasoning at best. Contrary to what debating culture in general might have you believe, pinpointing the weaknesses in an opponent’s reasoning is not the same thing as proving your own position right. In this article, we look into four popular “fallacies” that are often employed in dubious ways. It is our contention that a closer look at these matters will reveal that the business of logical fallacies is not at all as black and white as it is often made to seem. When faced with two competing explanations of a phenomenon where it is not possible to achieve certainty, the simpler hypothesis must be preferred. Our Comment: Occam’s Razor is a reasonable tool in fields like science and history where “facts” exist and where these facts can be accounted for as parts of a larger system, based merely on our knowledge of yet more facts. But ironically, Occam’s Razor is mainly used in fields like psychology and philosophy where “facts” are limited and have to be accompanied by a heavy dose of speculation. In other words, Occam’s Razor is often used in situations where it is not a suitable form of appeal. Western philosophy, for example, is founded entirely on assumptions. So for someone who claims to adhere to Occam’s Razor, the rational course of action is often to make no assumptions at all. Such a person would be unable to have any metaphysics, or any philosophy at all, until he acquires a philosophy that is entirely devoid of assumptions and first principles. If everything philosophical – including the philosophy of science – is founded on unproven assumptions, then Occam’s Razor becomes meaningless, and the true adherent of Occam’s Razor would simply say: “I don’t believe a thing.” And in the case of the psychologist, that same adherent of Occam’s Razor would follow Jung in postulating some species of solipsism (i.e. the belief that only the individual consciousness is knowable to the individual). The psychologist who truly obeyed the Razor could do away with the entire idea of ever knowing another person’s type “in itself” – all that such a psychologist could know was what type the other person seemed to be to his personal consciousness. Thus, the claim that Nietzsche was an Ni type could never be reasoned to be objectively more resistant to falsification than the belief that Nietzsche was an Se type – everything would be relative to the beliefs and impressions of the individual’s own consciousness. The thing about Occam’s Razor is that we all subscribe to a series of deeply-held beliefs. Not only do these beliefs differ from person to person, we also tend to hold on to them because we are predisposed to finding them appealing. In other words, the ideas that we cherish the most are not merely the product of deliberation – we also believe in them because they make intuitive, pre-cognitive sense to us. A whole range of factors go into determining which ideas the individual innately finds appealing. For example, the Big Five trait Openness to Experience can be shown to correlate with the level of complexity that one intuitively prefers. With regard to philosophy, David Hume had a higher complexity preference than Ayn Rand did. With regard to typology, C.G. 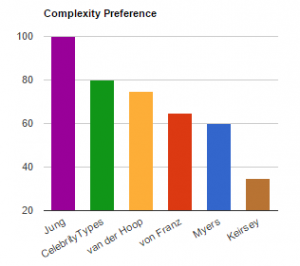 Jung had a higher complexity preference than David Keirsey, and so on. And so, oftentimes when someone throws down Occam’s Razor as a way to “win” the argument, all they are doing is demanding that someone else’s complexity preference should be cut down to size until it matches their own. In other words, they are neither proving nor disproving anything, but merely re-affirming their own confirmation bias. They are using their own subjective standard to assert that the complexity of a field could not possibly be more than what they prefer, and they are begging the question as to why the complexity could not possibly be less than what they prefer. Because an expert or authority says something, it must therefore be true. Our comment: The Appeal to Authority is not a valid argument. But the fact that Appeals to Authority are not arguments in themselves tends to get blown out of proportion and taken by blowhards to mean that their opinion is just as good as that of a consensus among experts. Appeals to Authority are not arguments, but that does not mean that it is by definition wrong to defer to the claims of experts with deep domain knowledge and extensive experience in their field. Of course it is entirely possible that the experts are wrong, but after all there is usually a reason that a given view is the majority view among experts. The act of exaggerating an argument to its farthest possible extent (i.e. to absurdity). The cry of Reductio ad Absurdum is often used by people as a means to defend their own sloppy reasoning. Some textbooks have even taken to describing the Reductio ad Absurdum as a fallacy “because anything can be reduced to absurdity.” But in fact, the Reductio ad Absurdum need not be a fallacy at all, but may just as well be used as a means to expose the fallacy in a given piece of reasoning. Employed properly, the Reductio ad Absurdum stays with the original line of reasoning, but then exaggerates it to a point where it breaks the position of the person who advanced that reasoning to begin with. Unlike the Slippery Slope fallacy, the Reductio ad Absurdum does not give itself a license to pretend that there is only one possible outcome when in reality there are many (e.g. “If we allow racist cartoons to be printed, ethnic minorities will eventually be sent to camps.”). Often, the Reductio ad Absurdum simply reveals that a person’s stated reasoning is incomplete – that he or she needs to sharpen his reasoning by coming up with additional and improved qualifications for his argument. This may sound trivial, but many a would-be expert has seen his position disintegrate and crumble in his hands because he was forced to flesh out his qualifications. Far from being inherently fallacious, then, the Reductio ad Absurdum can often be a useful tool in logic. Any reference to evidence that is observed outside of repeatable, controlled experiments is by definition fallacious. Our Comment: People often dismiss anecdotal evidence for no real reason. The refusal to admit anecdotal evidence into a discussion is especially impertinent when large numbers of people report seeing the same thing, such as the UFO sightings reported by both Allied and Axis pilots during World War 2, or the comparable events reported by large numbers of near-death experience survivors. Of course, these occurrences are not proof of aliens or an afterlife – but they are evidence of something, and that evidence cannot be categorically dismissed. Ultimately, all of our knowledge rests on personal experience. Only a small modicum of that experience is ever formalized, controlled, and elevated to the status of “formal evidence.” Even in cases where formal knowledge actually is available to guide our outlook, that evidence rarely reaches a certainty of 100%. Indeed, we are more often faced with matters of more or less than matters of black and white. In the absence of formalized evidence, anecdotal evidence cannot be categorically dismissed. Of course, none of this is to say that there actually are several parallel universes; that Kanye West actually does have a preference for Fe over Fi; that more complexity is necessarily better; that the scientific consensus on how to cure leukemia cannot be improved; that Friedrich Nietzsche actually was an Ni type; that “face reading” actually is pseudoscience; that Charles Darwin actually was infected by a parasite, or that Jungian typology, given future and more cogent standards of measurement, will turn out to have strong scientific validity (or none at all). As the American statistician Cosma Shalizi has said, there are people who desire to possess profound knowledge without having to make a profound effort at thinking. From afar, Jungian typology may sometimes look like a magic wand that miraculously enables the individual to come up with deep and special insights without making much of an effort. However, as the multitude of would-be experts and ill-researched material on Jungian typology attests, there can be no substitute for effort. We would give ourselves the same Complexity Preference as van der Hoop, if not for the fact that we have begun to follow Jung in exploring the normative side of typology, e.g. here, here, here, and here. You are right that the application of Occam’s Razor to philosophy leads to the death of metaphysics. But, instead of giving up Occam’s Razor, most modern (analytic) philosophers have instead opted to eschew metaphysics. Your first example of an unreasonable use of Occam’s Razor isn’t, in my view, unreasonable at all. If the assumption of multiple universes is not necessary to explain our experience to the point where such a sweeping assumption can be justified, then Occam’s Razor disposes of it. Of course, there are plenty of eminent physicists who do think the assumption of multiple universes is necessary to explain this one, and I’m not saying that they’re wrong, merely that the burden of proof is on them to show that it is necessary. This kind of epistemological relativism may make online discussions more pleasant, but only if there are no epistemologists present :). Epistemologists hate the idea of epistemological relativism, because it makes their field irrelevent. Fotunately for them, it is necessary to have standards, like Occam’s razor, to judge the reasonableness of these “deeply held beliefs”. Otherwise, intellectual rigor would be abandoned. I could create a philosophical belief system based on the assumption that unicorns exist and nobody would be able to call me out on it, so long as I was internally consistent. Of course, in the real world, people would point out that my system was founded on more assumptions than are necessary to explain our experience; unicorns don’t help things make sense. In other words, we need Occam’s Razor in philosophy to judge the veracity of philosophical assumptions, and it’s a much better, more impartial standard than just looking at the degree to which an assumption is “deeply held”. But isn’t solipsism still the most obvious assumption? What we mean is that philosophers often (always?) postulate *something* which cannot itself be proven, not that they are “rationalists” in the narrow sense of the word. Hegel had the world spirit; that certainly seems like an unfounded entity. Locke had the “I-know-not-what,” and even Hume had “the understanding.” Our point is that you cannot have *any* philosophy or theory of value (that is not circular) without some species of metaphysics, or some ordering concept that is in part “brought to the table” by the subject. Needless to say, I am not impressed with the modern attempts to do philosophy and values without metaphysics; as far as I’m concerned, they all still rely on exactly the thing that they’re so proud to be free of. It’s not even a question about who’s right or wrong; simply about recognizing things for what they are. For the same reason, the best physicalists acknowledge that their physicalism is metaphysical and could not be otherwise for any number of years to come. This is a good interjection, because this is exactly where we disagree: It’s like the discussion about the Kantian Noumenon, only applied to physics. One camp says, “Well, there’s no need to assume unless…” and the other says, “Well, since we can’t know, it might as well be…” There’s essentially an a prioric disagreement over the burden of proof. I’m not so sure that the unicorn example could be made to adequately fit that disagreement, though. As far as I know, none of us are epistemological relativists. I see how the piece could be read like that, and I’ll grant that it could have been clearer. What happens in that section is that we go from normative to the descriptive, trying to give a psychological explanation for why *exactly their* complexity preference is the right one. 1. No, not really. As I said in my comments on the Hume article, I don’t think the distinction between solipsism and non-solipsism actually says anything; it’s purely semantic. Solipsists look at their experiences and call it the workings of their mind, non-solipsists look at their experiences and call it the workings of the world, but they’re not actually making different claims. Solipsists just define sense impressions as part of their mind, while non-solipsists don’t. You might be asking whether Occam’s Razor should cause us to disbelieve in other minds; I don’t think so, because I think “other minds exist” is a reasonable extrapolation from my experience, I.E. my experience makes more sense to me if I incorporate the existence of other minds. It seems to require fewer assumptions than the idea that other people are philosophical zombies who only appear to have thoughts. Especially since neuroscientists can actually see the neurons whirring away in people’s brains. I don’t see why it’s a problem that philosophers postulate things that cannot be proven; Occam’s Razor doesn’t demand “proof”, it just demands that postulations have some explanatory power. So Hegel’s world spirit would pass the test if it was the most succinct way to explain elements human existence. That’s a much lower standard than conclusive proof. Hegel’s world spirit, in my view, doesn’t pass, but something like Jungian Typology arguably does, even though there’s certainly no proof that “fi” exists. Nevertheless, it’s reasonable to use “fi” as an abstraction of a certain way of dealing with emotions and sentiment (emotions and sentiments themselves being an abstraction from neurology, and so forth) because it has explanatory power for why and how people think the way they think and say what they say. I don’t know what you mean by “the best physicalists acknowledge that their physicalism is metaphysical”. The definition of physicalism is that there is no “meta-physics” – everything is physical. 3. Well, Occam’s Razor is a heuristic, not a proof. It doesn’t “prove” the Noumenon doesn’t exist. It does, however, raise the question of why anyone would want to believe it does, since it is an assumption that has no explanatory power. I think the unicorn example is pertinent here. It’s like if someone came up to me and said they believed in unicorns, not because of any experience of unicorns on their part, or because they think their experience suggests unicorns exist, but because they just want to. Now, there’s no reason unicorns couldn’t exist on some far off planet that we don’t know about; that’s perfectly consistent with everything we know. There’s just no reason to believe in them, and I think we should only adopt beliefs that are useful to us (I’m something of a pragmatist). I don’t see how a belief in the Noumenon is useful. Of course, people don’t usually choose their beliefs (I couldn’t bring myself to REALLY believe in unicorns, even if I wanted to), but I can’t understand why anyone would believe, of their own will or not, that the Noumenon exists. I’d be interested to hear your reasons. There is also the argument, from Nietzsche, that there should be a teleological razor in addition to (or perhaps instead of) Occam’s Razor, that entities should not be postulated beyond necessity, not for understanding, but for living a worthwhile life. So the Noumenon should be rejected, not just because it doesn’t help us understand, but because such a belief is deleterious to our vitality; we become preoccupied with an imaginary, hypothetical world of no real value, rather than our real experience. So the Noumenon isn’t just pointless, it’s harmful. 4. Well, to me it read like you didn’t think there was any way of judging which “deeply held”, foundational beliefs are the right ones, which seems relativistic to me. If you do think such a standard is possible, I’d be interested to hear how it differs from Occam’s Razor. The problem is that, from what you have written, you actually appear to fall squarely into the trap set forth in the article. You are judging the simplicity of ideas purely by “what makes sense to you” — your own cognitive biases — or what fits best with your personal knowledge and experience. This leads to bad philosophy, because nobody’s ever managed to give a good philosophical reason to believe the Self exists, or even what the Self is, never mind whether the sensory impressions a “person” experiences reflect any kind of reality. It’s just a “Believe what you want” perspective, yet almost everyone thinks they’re right. I can see how it might seem that way, but I’m using the phrase “makes sense to me” in a fairly technical context. When I say, for instance, that the existence of other minds makes more sense to me given my experience, I mean that it, in my view, requires fewer assumptions than the alternatives, and has greater explanatory power. It’s not as if I were saying that, say, creationism is true because it “just makes sense to me”. Occam’s Razor isn’t a matter of personal preference or bias, it’s an objective, impersonal standard that I’m applying to my experience. Simplest explanation = explanatory power – number of assumptions, whether it’s close to my current thinking or not. You seem to think that, in the absence of complete certainty and irrevocable proof, everything goes out the window and people can justifiably believe whatever they want. In actuality, most philosophers these days don’t think that kind of proof is possible (those that do, like Ayn Rand, are widely mocked), so they settle for probabilistic or pragmatic standards instead. Nobody’s been able to Prove with a capital P that sense impressions reflect any kind of reality, but we can show that they are useful. I’m inclined to the position that sense impressions ARE reality; it’s not about “reflecting” anything. Our experience constitutes our reality; the self is real because we experience it as real. Of course, you can hypothesize any number of deceiving demons or faulty sense apparatuses to show that I might be wrong, so certainty is impossible. But certainty really isn’t that important; what’s important is the best explanation, the one that will furnish us with the clearest possible picture. Why would the existence of other minds require fewer unfounded assumptions, and have more explanatory power, than the non-existence of other minds, if referencing your own experiences, knowledge, and biases isn’t an option? You misunderstand me. I didn’t mean that because this kind of proof and certainty probably aren’t possible, therefore people should believe anything they want. Instead, I think it’s unwise to believe in any “knowledge” or “truth” wholeheartedly, and it’s a good idea to keep in mind we’re alnost certainly wrong about pretty much everything. All in all, however, I don’t think we really disagree very much — we’re just approaching things from different perspectives (I’m an INTP, and you sound like a Te type). Im of the position that sensory impressions reflect some form of “reality” too, to some level of success. However, I don’t see how I can justify this belief using hard philosophy — for both of us, it’s merely a matter of faith. I’ve been trying to figure out why you made reference to modern philosophers as a response to me, but I can’t work out your point. You’re essentially saying, “Modern philosophers agree with you that a self-referential internally consistent philosophy founded on logic and reason is impossible, but unlike you go on to use cop-out criteria like “usefulness” in defense of their claims.” (if that’s a straw man, please point out where Im misunderstanding you). I don’t really see how this is a good response to anything. If our perceptions REALLY ARE reality, does that mean everyone has their own reality (not merely perception of a singoe reality), and that truth is subjective. For example, if a colour-blind girl says she only sees certain colours, then only THOSE colours exist in reality — to her — and that other people are seeing a different reality (unconnected to the girl’s) if they see those colours? 3: Kant was led to postulate the Noumenon on the basis of Swedenborg’s mystical experiences, among other things. In the same way, it might be argued that Buddhist enlightenment offers a glimpse of the ineffable, devoid of human thought categories. Hence it might be argued that there is some experiential basis for postulating some mode of cognition that is different from phenomena as we usually experience them. But you seem to agree with what we say; that there is room to disagree and that people’s preferences are temperamentally different. So if your contention is that Occam’s Razor doesn’t disprove things like the Noumenon, then there is no disagreement on this point. With Nietzsche, we are again back at the value problem: Ask a Buddhist, and he will say that the most important thing in life is to achieve enlightenment, so he would very much need to believe in the reality of some state of cognition outside of ordinary human thought categories. And conversely, he would say that Nietzsche is trapped in a cycle of birth and death. 4: I’d say it was possible by largely Popperian means. I don’t agree with Popper that all claims should be falsifiable, but personally, I prefer the (attempted) falsification of claims to Occam’s Razor. The Razor always seemed to me to have an inbuilt bias for simplicity and for human cognition itself. And I think that harks back to the psychological-temperament disagreement over knowledge: Ti types often start from the world as they imagine it, devoid of their own viewpoint, or devoid of human cognition. But with the Razor, it seems to me that we get an anthropocentric universe. Naturally, for all the Ti types’ labor, human cognition is still inbuilt in their postulates as well, and so we arrive at the impasse. If the ti type “starts from the world as THEY imagine it”, how could that “imagining” be devoid of human cognition? Don’t all “imaginings” involve human cognition by definition? And if it’s THEIR imagining, how is it “devoid of their own viewpoint”? You seem to acknowledge these problems saying that “for all the Ti types’ labor, human cognition is still inbuilt in their postulates as well, and so we arrive at the impasse”. But why is this an impasse, rather than the abject failure of the ti-type to think the way he wants to? Haven’t we just shown that this way of thinking is incorrect? And why is it necessarily a problem that with the Razor we get an anthropocentric universe? Haven’t you just argued, via “human cognition is still inbuilt…”, that the ego-less “god’s eye” view of the universe is impossible, in which case an anthropocentric view of the universe would be the honest and correct one? Van der Hoop talks about this in one of his books: He describes how Ti types (e.g. Kant) desperately want their reasoning to make sense independently of themselves. So they create these mechanic/robotic systems of rules. But of course, as you point out, it’s still their reasoning giving form to some imagined robotic system. So they can’t escape their own starting point, even though they want to. The reason it’s an impasse (I’d say), rather than a failure, is that the effort may still have value even though it “fails.” There are no perfect circles in nature, either. But that doesn’t mean that we can’t attempt to talk about or imagine them. On the one end of the spectrum, you get an imagined objectivity that comes from actually believing that you are capable of perceiving the world without reference to your own starting point (Parmenides). On the other end (if you think that it is a failure) you get relativism, i.e. “since perfect objectivity is impossible anyway, why strive to get as close to it as possible?” In the middle, you acknowledge the value of the attempt, while remaining open to its incompleteness (like Hayek). “the effort may still have value even though it ‘fails’. You seem to be saying that, though the ti ontology may be fatally flawed, we should still tolerate it because the ti-types efforts still have value. But that seems like saying we have to throw the baby out with the bathwater. Why can’t we keep, say, Einstein’s physics, or even Kant’s metaphysics, while acknowledging the central role of their viewpoints in conceiving them, and that any ontology which ignores the role of human cognition is wrong? No, that’s not what I’m saying. I’m not entirely sure what we’re discussing here, other than I feel compelled to repeat myself: Though there is no observation devoid of reference to the subject, that doesn’t mean that one couldn’t/shouldn’t attempt to blot it out from time to time. I’m not sure if ontology is the right word here, either. I’d call it an aspiration or approach.